It is no longer surprising that computer security has become the top priority of every operating system developer, software engineer and the ordinary user who aims to keep his/her computer and the containing data secure. While the developers experience difficulties making their software virus-proof, users are faced with a challenge of picking a trustworthy antivirus utility that would help add a layer of protection to the computer’s security. With so many of such utilities to choose from, it might be quite an overwhelming task, especially if you are not quite sure of what exactly you are looking for. One of the initial criterion according to which the users choose an antivirus utility is based on whether the program is expensive, affordable or free. The last category tends to receive most attention because even though the users are concerned about the security of their devices, most of them do not enjoy spending money on expensive utilities. 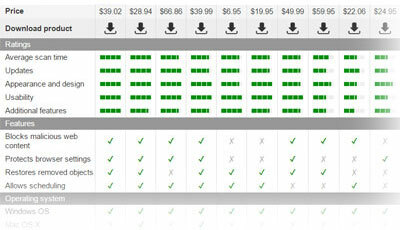 Undoubtedly, paid software always offers some extra features that free applications normally do not have. Nevertheless, both, free and paid antivirus tools are created to protect computers and they do that more or less effectively. 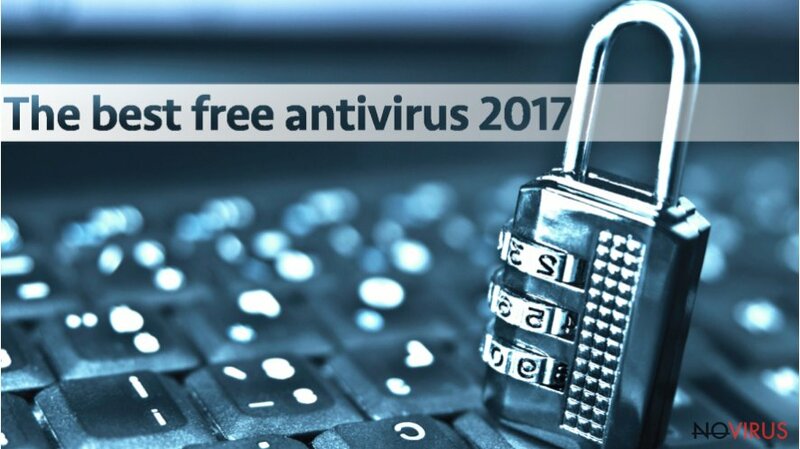 In this article we are going to discuss the free antivirus software that we think deserves user attention in 2017. 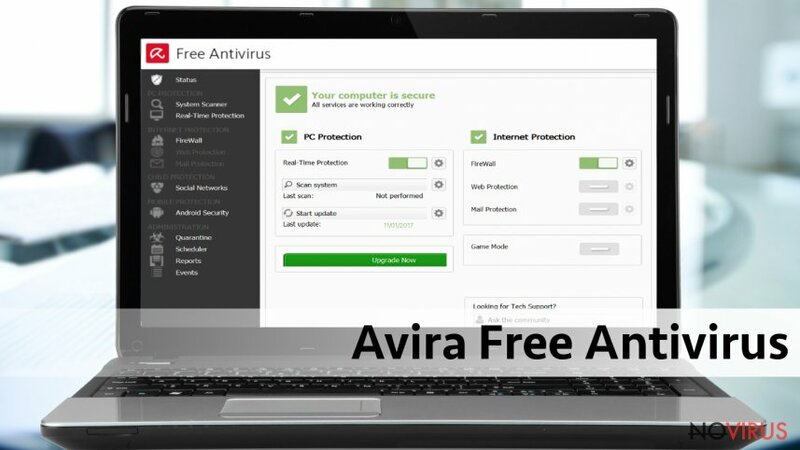 Avira Free Antivirus is an inclusive system scanner featuring quick scanning capabilities and convenient controls. The tool’s comprehensive interface allows even the least technically advanced users to operate the program easily and clean their devices from undesirable software. In particular, Avira Free Antivirus protects against Trojans, ransomware, worms, spyware and a number of other cyber infections which aim to corrupt computer systems. Since the Avira scanner is based on a cloud system, it means that the antivirus databases are being constantly renewed and replenished with descriptions of new viruses and their versions. Independent tests show that Avira detects 99.9% of malicious files, which is an outstanding advantage. The software doesn't overwhelm the system, which means that it helps to keep the computer malware-free without causing system slowdowns. Besides, cloud-based scanning allows the infections detected on the corrupt devices to be checked in real time. More functionalities of this antivirus utility as well as its download page can be found on the Avira Antivirus official website. Bitdefender Antivirus is a goldmine of a program for the users who are not willing to spend tens or even hundreds of dollars just to feel safe when browsing the web. Besides, it is a trustworthy tool because it hardly provides any false-positive results. With this tool, all the anti-ransomware, anti-phishing, anti-malware capabilities will be active at all times, and on-demand and on-access scan engines will prevent you from visiting suspicious and plain fraudulent websites or accidentally installing some infectious utility. 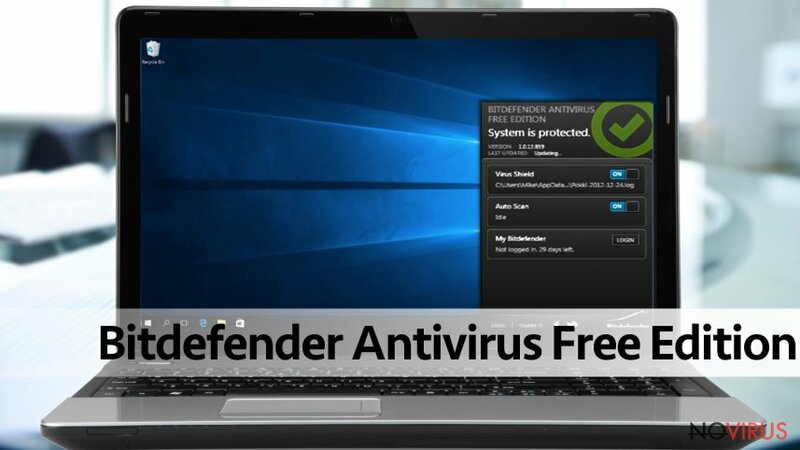 Bitdefender Antivirus is specifically designed for Windows operating systems, but the company does not leave Mac and Android users aside and offer other security solution for these operating systems as well. You may find all of Bitdefender’s products and their descriptions on the official Bitdefender website. After you learn more about these utilities, you may choose the one that suits your needs and system requirements the best. Avast Antivirus is a multiple award-winning, worldwide-acknowledged antivirus developer which is best known for offering free but powerful malware scanner for Mac, Windows and Android operating systems. Ransomware, adware, worms, browser hijackers are the malware that Avast Free Antivirus mainly focuses on. Thus, such parasites are easily detected and banished from the infected system. Nevertheless, apart from scanning the devices on-demand, this antivirus tool also provides real-time protection that blocks unreputable websites, prevents phishing attempts and warns about potentially malicious downloads. Finally, this program even checks the connected devices, including USB drives, phones, TV’s or printers to determine whether they are safe or not. There are more features of this program that we haven't yet mentioned. If you want to find out more about the Avast products, please visit security vendor’s official website. 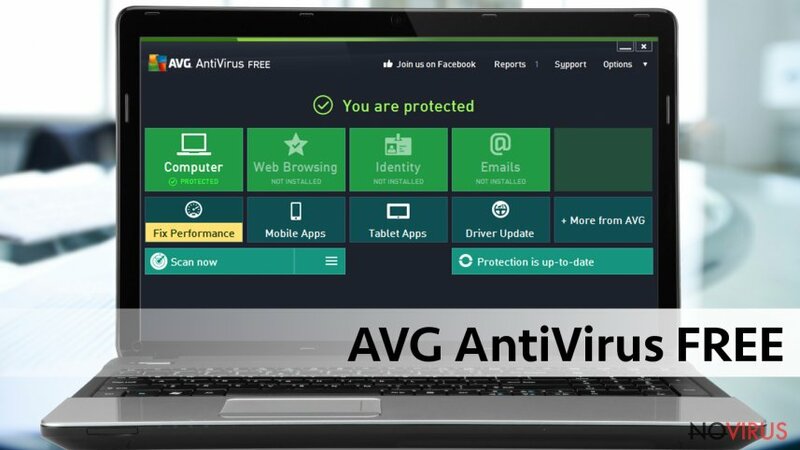 Another antivirus tool that might be worth your attention is AVG AntiVirus Free — an easy-to-use software that offers reliable protection for a number of operating systems, including Windows versions starting from Windows XP, Mac OS 10.8 and later, as well as Android 2.2 and later versions. Sophisticated AVG scanning capabilities ensure that the device is scanned both, for undesirable virus activity and system performance issues. Besides, due to a simple user interface (UI), you will not get lost within the program’s settings since the program will do most of the thinking for you. When using AVG AntiVirus Free, you may also allow yourself to forget about regular software updates as the antivirus will download them automatically itself. Generally, it is a handy tool which covers most of the daily security chores most of us often tend to dismiss. If you are already thinking about obtaining this program but want to find out a bit more about its functionalities, please read this article. 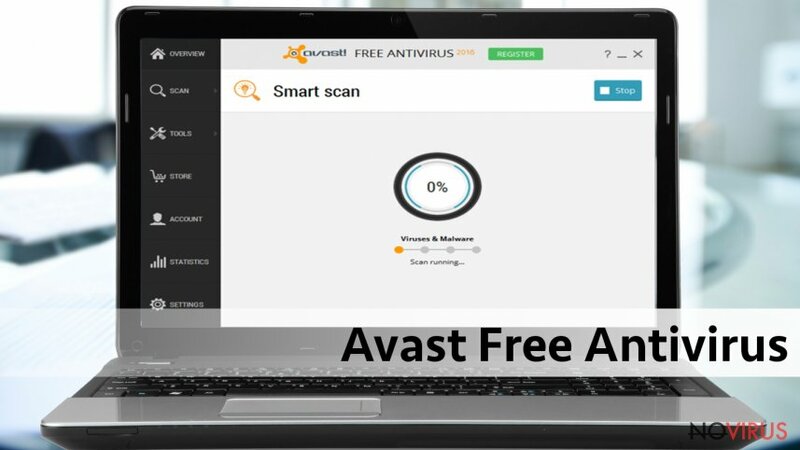 Most computer users dream that reputable and powerful antivirus software would come free of charge. Panda Free Antivirus may just be on its way to make these dreams come true. Though the program is a lightweight tool, its powerful system scanning capacities are undeniable. Besides, devoted browsing enthusiasts will also love the real-time protection feature which will warn about dangerous drive-by downloads and suspicious software installs as well as prevent users from visiting potentially dangerous websites that might carry out phishing attempts or try to involve users in tech support scams. In the case of emergency, Panda Free Antivirus also offers Rescue Kit utility which can be especially useful in computer decontamination after some serious malware attacks. Perhaps the only drawback of this program is that compared with some of the previously mentioned utilities it takes longer to scan the system and indicate the threats. 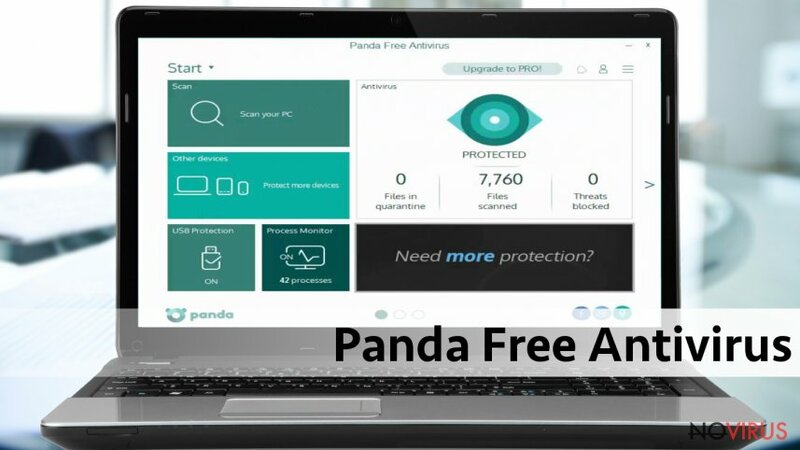 Other than that, Panda Free Antivirus is a reliable tool that will provide your device with a sophisticated protection and ask nothing in return. More info about Panda here. Reimage is a versatile program that provides its users with useful antivirus and system optimization features. Its collaboration with antivirus giant Avira Antivir makes this application a trustworthy software that helps exterminate malware, viruses and any type of cyber threat you can think of, while the optimization functions allow to boost computer’s performance and fix the device after major cyber attacks. It is critically important for Reimage creators to provide their users with the best service possible, without adding additional strain on the computer’s performance. Thus, the program does not interfere with other running programs and can work together with different antivirus scanners. A year subscription to this program costs €37.95, which is, obviously, not free. Nevertheless, if you take your computer security and system stability seriously, purchasing Reimage is an investment that will definitely pay off. Make sure you read this article to learn more about Reimage. This post was published on 2018-03-06 at 11:04. Category: Anti-spyware software, News.